On a trip to the farm recently we had a full on day of harbour removal. I know that that sounds like some large-scale sea-scaping, not something that you would readily associate with an inland area like Strathbogie! Harbour removal is clearing of rough or overgrown areas in paddocks that can be used as safe havens for undesirable creatures, such as rabbits and foxes. Some of this involved the removal of rough rocky outcrops, which are useful for erosion control, and the collection of fallen timber. We collected as much of the wood we could for fire wood, the rest which was heavily burnt or rotten was collected together and burnt. 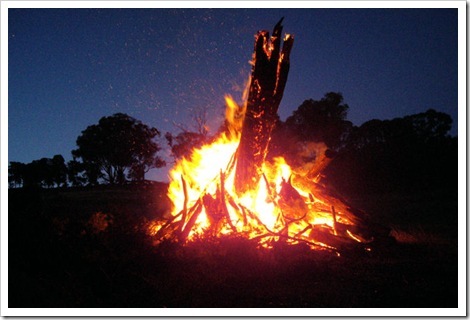 It nice to see some reward for a hard days work, and there aren’t many better rewards that a nice big bonfire. Before anyone complains this isn’t a case of wanton destruction of native trees and habitats. Many areas of the farm that are unsuitable for grazing, being too rough and inaccessible by humans, have been fenced-off and and returned to natural bush or replanted with native trees. All in all a net gain for Australian flora and fauna. In the replanted areas there has a been a noticeable increase in the number of birds, and no doubt other wildlife as well.